Frozen yogurt is very popular in America and Europe but new and original in Asia especially Macau S.A.R.. They usually are expensive or only single flavor available. Therefore, YOGO decreases the consumption barrier and allows more people to try new exciting flavors created in our labs. The first YOGO store was established in Mei Hou Shopping Mall with full of wonderful childhood memories for most 80’s in June 2015. The first attempt was beyond expectation, the wave of YOGO has washed the market incredibly. YOGO strictly follows the principles of healthy, delicious, fair price, innovation, passion, and best quality service. "Innovation" makes YOGO outstanding among others. We have our own R & D team to develop new flavors and products. We also improve or development by getting different opinions from different parties. Our current flavor offerings is over 20, and we are developing different other products, including drinks. YOGO attracts more people to try frozen yogurt with good quality and reasonable prices, and has won the trust and deep appreciation from our customers. With our consumer groups expanding, YOGO will keep our principle as always, and maintain that level of quality you have become to trust.. We are proud to be YOGO. Our commitment and top priority is providing you the best tasting frozen yogurt. YOGO's Yogurt Base has over 20 flavors, including original, strawberry, blueberry. peach, pineapple, litchi, kiwi, mango, banana, orange, durian, cheese cake, matcha, red tea, green honeydew, chocolate, caramel, sea salt, coffee, black sesame, purple sweet potato, red bean, honey, red wine, etc. 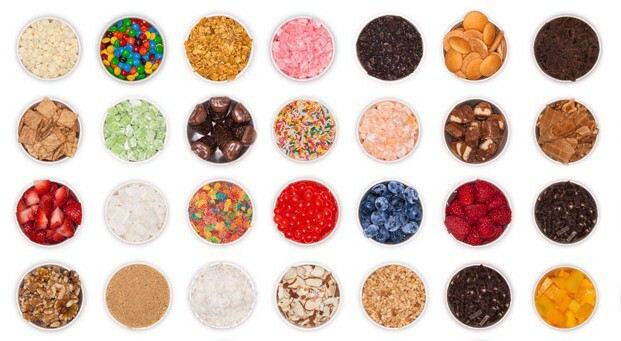 You have over 30 options on YOGO's toppings, including fresh fruits, cereals, candies, jellies, nuts, cookies, chocolates, desert sources, etc. YOGO has not only traditional frozen yogurt cup, but also has various products including slips, non-alcohol drinks, and cocktails made with yogurt. You will be experienced different here! Franchising is a long-term cooperative relationship between two entities— franchisor and franchisees—that is based on an agreement in which the franchisor provides a licensed privilege to the franchisee to do business. Franchisor grants the license to franchisees for the conducting of a business under their marks, not only specify the products and, but also an operating system, brand and support. All the responsibilities and returns on the above licenses will be explained detail in the contract. Franchisor and franchisees will be operating independently and obtaining the benefits from this relationship. Franchisor can expand the business and meanwhile franchisees can reduce the risks while entering a new market. It achieves win-win. Learn more about becoming a YOGO's Franchise owner! Thank you for your application. You are on your way to becoming a franchise! We will be in contact soon.